Just when you think the Marine is going to ignore the kid altogether, he does something that surprises everyone. A video released almost 20 years ago gets people talking every year around the holidays, and it’s back again. 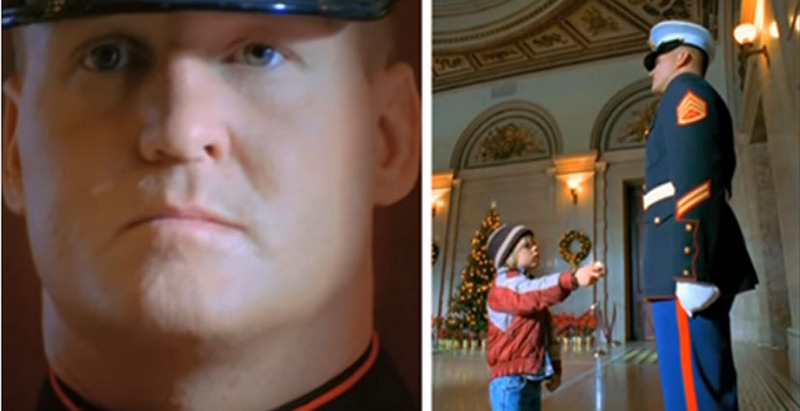 It starts with a little boy walking up the a Marine guard on duty, asking if he is Santa Claus. The man ignores the little boy, standing at attention and never meeting the soft eyes of the curious little boy bundled up in his snow gear that’s half his size. Then the boy reaches out his Christmas list, hoping that the Marine whom he thinks is Mr. Claus will take it and bring him gifts. After a moment of pausing, the video shows the otherwise motionless guard unfold his left hand and take the list from the little guy. The commercial is a classic, and it’s used to promote the U.S. Marine Corps Reserve Toys for Tots program. The program started in 1947 by reservist Major Bill Hendricks and is still in practice today. Every year the program collects thousands of toy donations that are delivered to children across the country. The commercial is probably the most popular the Marine Corps Reserve has ever released, having been viewed on YouTube alone almost two million times. The video is so touching because it shows that the smallest effort, like giving a child a new toy -- or even taking the Christmas list from a curious child -- can make the biggest change! Watch the whole commercial below.